LMAO, if I build it will they come?! I can do bunk beds if ya'll wanna come for a visit! That would be fun. Should I bring my new pet rattlesnake? They don't move around much at -40. BTW, you do realize ALL those nice toys in your garage can kill you just as dead. Right? I'll bring them with me! Nice and nippley up there. Snuggle, fondle, etc. 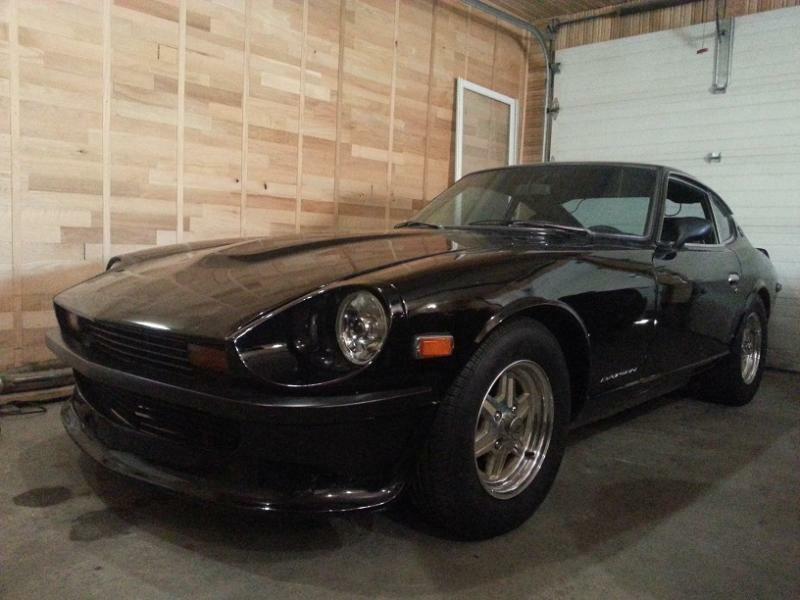 I prefer to die in my Z upside down in flames. Hahaha, I like any earthly creatures (more than I like most people), but some I just like to stay away. Half of my childhood was in Europe, we had some deadly snakes in the bushes behind our house, you walk the trail and they are just hanging from bushes and everywhere, it was creepy, lots of horned vipers. I just got used to living without them!!! Tomorrow..I shall tackle the rear bearing, see whats all up in there, and why the wheel go clunk clunk, hopefully it's not the hub or the stub, if it is eeehhh, waiting for parts again then. Yep, I too am waiting for parts ... in my case though, there's plenty of other things to address while they come in. 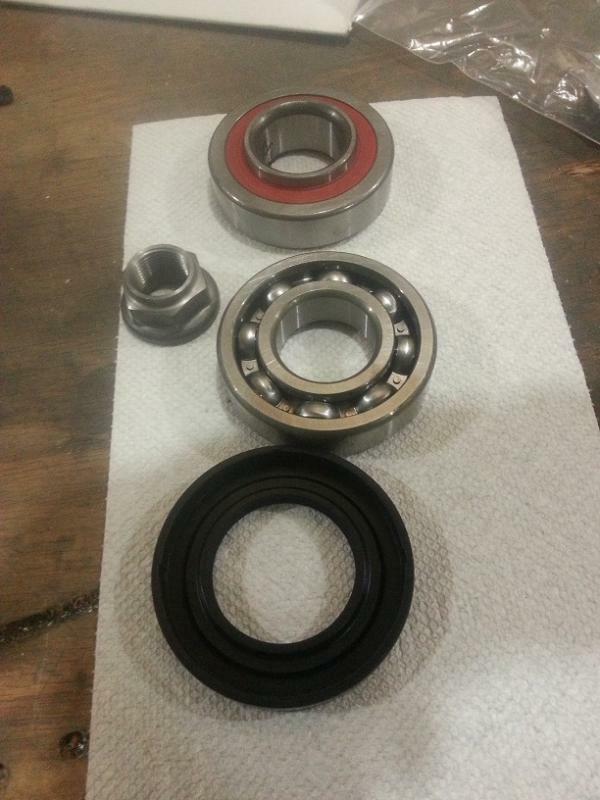 Shes a battle boys...got the old bearings out, will have to get the far one pressed off and pressed on, tomorrow. Nothing looks bad or damaged, but who knows, Ill replace it and see if the play is gone. 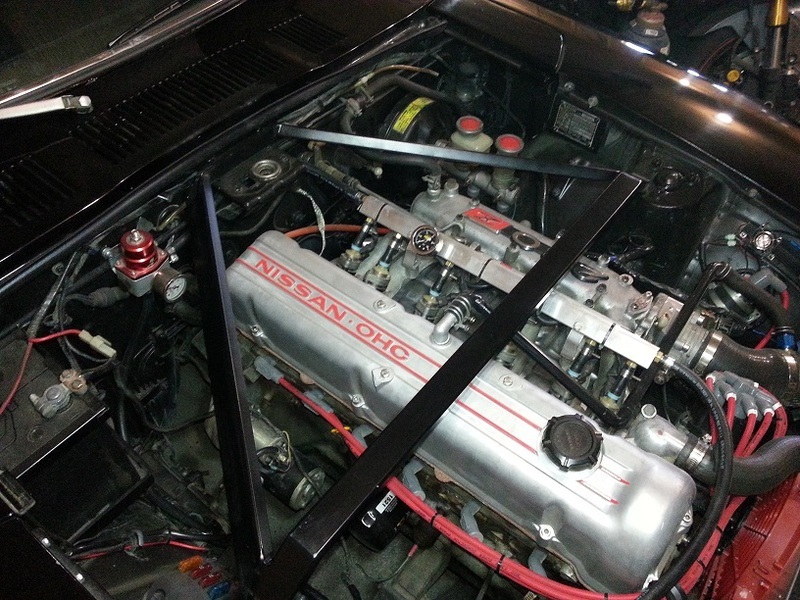 One thing I screwed up was order the wrong stub nut, should have gone with a 280zx turbo one, but I must have miss clicked, this ones a regular, one you have to peen on, ugh. The only thing I have noticed, the outer bearing, the outer rim is thinner than the new one I have, they are same size OD, I measured...not sure whats up with that. Last edited by Skully; 03-04-2015 at 10:32 PM. The new stuff is so nice. Well of course, it's new. Looks faster too! You are doing both sides, right? Scully, define clunk clunk. 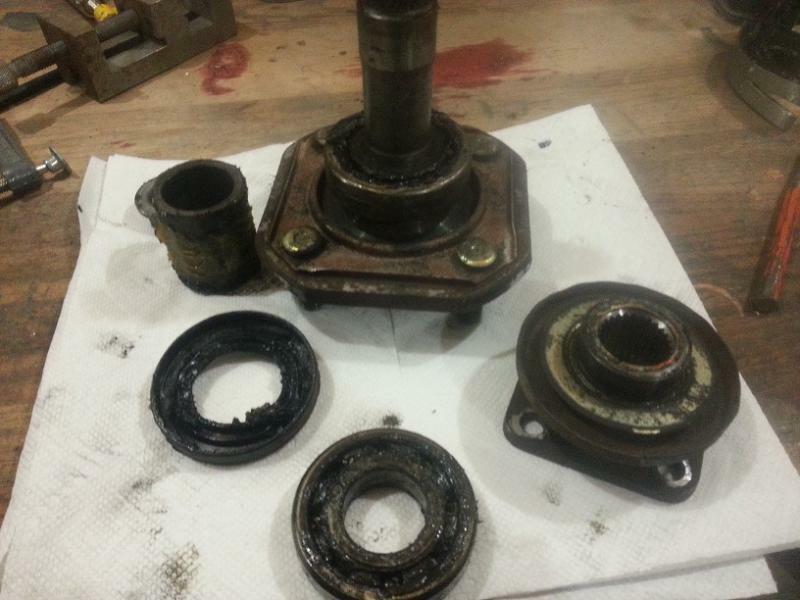 Wheel bearings usually some like a freight. Do you get a clunk when you start out or accelerate? Or is it more like clunk---clunk--clunk-clunkity clunkity as you start out? Check your axles and drive shaft. Pry up on the front diff mount to check for broken mount. I'll send someone to help you. Yes doing both, when the wheel is off the ground hands at 12 and 6 or 3 and 9 and when you move it, its sloppy, when I drive it, when it hits a bump, it used to clunk. I put it up in the air, took a mallet, and just tapped the tire, and it clunked, so I kept tracing it down to the bearing, which do move. OK so I'll cancel the helper. I thought she was already on the way...not like you can just cancel that. OK as you can see she likes the cold weather. Well shes back on all 4s again. Put new bearing in, went smooth. There is no play in the wheel at all, spins smooth, tight but smooth. Torque wrench only went up to 150 so I went to 150 and have her a little more umph, peened the nut on called it a day. Hopefully it lasts and the wheel doesn't fall off. Well shes back on all 4s again. Oh rats! At first I thought Skully was talking about his new "helper". Then I got to thinking ... could it be that the helper Ramz sent up is the same woman who modeled Skully's avatar???? I certainly can see a couple of similarities. Haha I wish, on all accounts. I also put in the shorter strut insulators in the back, so that dropped it a bit, and front is dropped slightly too, just enough for me. And the roads are so bad, I am dodging potholes and lakes with my truck at the moment, the city has horrible roads, so bad I don't even ride my bike much because of it, its too much hazard. Last edited by Skully; 03-08-2015 at 03:02 AM. Your car looks bad a$$! It's hard to get good help these days. I enjoy helping young people learn a trade. I got her a job at the steel mill, melting steel. got home from work, all the snow was gone, first time in 18 years living here have I seen winter end this early (at least the cold)! So I went for a drive hah yay! I ordered some 7/16" (11mm) fuel hose for the fuel tank suction, could not find anything local ugh. Will drain the fuel tank see if I can fix the slight leak. Woohoo. Congrats on Spring busting out all over. Soon busts will be springing out all over. I hope the roads are being kind to your suspension. Man hot wather is nice!! Anywhoo...Started to install weatherstripping, got the doors, hatch and one 1/4 window done, night and day difference on noise, wind etc. Installed some bracing front and rear, got some new tires on it, the ride is pretty smooth, dodging potholes, more like craters, left and right, our city is horrible for roads, I haven't seen roads this bad even in Bosnia in the 90s.